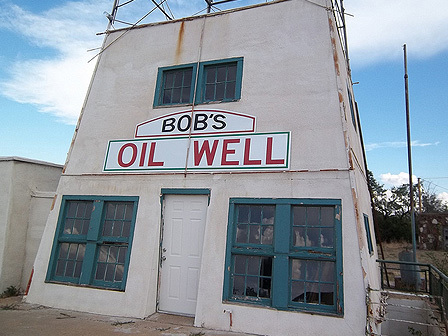 As one of the state’s once-flourishing roadside businesses, Bob’s Oil Well is a landmark at the junction of two heavily traveled highways in West Texas. Constructed in the early 1930s by Bob Robertson, the tourist destination and service center featured an exaggerated and oversized oil derrick. Several buildings remain, including the derrick, station, and a diner constructed of stone and petrified wood. The site is threatened by neglect. The Bob’s Oil Well protection crew hired help to finish carpentry, roof, and stuccoing and have pretty well used up the donations they received for the project. They will have the outside repaired and renovated, but the inside (and their Visitors Center) will have to wait until they get more funding. Please help them finish the project by donating to Marisue Potts, Bob’s Oil Well, PO Box 523, Matador, TX 79244. A crowd of enthusiastic and in some cases teary-eyed supporters turned out today for the unveiling of the historic marker for Bob’s Oil Well. Named to Preservation Texas’ Most Endangered Places List in 2004, this 1930s tourist stop and restaurant connects the town of Matador and near communities to fond memories of good hamburgers, social gatherings, and funny stories. Located at the intersection of US 70 and Texas 70, Bob’s drew travelers from near and far to see the caged rattlesnakes and exotic animals including monkeys, lions, coyotes and a white buffalo. Luther Bedford “Bob” Robertson, a veteran of World War I, came to Matador in the 1920s. He was a filling station attendant in 1932 when he decided to open a service station. To promote his business, he built a wooden oil derrick over the station. In 1939, he replaced the wooden derrick with one of steel that reached 84 feet in height and included lights. Robertson paid long distance truckers to place advertising signs at strategic points across the nation noting mileage to Bob’s Oil Well in Matador, and his place became well know to the motoring public. Because of his success, Robertson enlarged his operation to include a grocery, café and garage. Bob Robertson died in 1947 and within two weeks a high wind toppled the steel derrick that had been the trademark of his business. His widow restored it two years later with even larger lights, but the business did not continue and it closed in the 1950s. Today, the site serves as a reminder of a time when such bold roadside architecture was in its infancy and of a man, who through his business, widely promoted his adopted hometown.